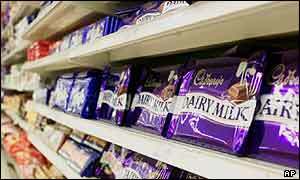 Spanish and Italian restrictions on the sale of British chocolate are illegal, the European Court of Justice has ruled. Both countries were wrong to insist British products could not be sold as chocolate because they contained less cocoa than most of their own brands, it said. The court said British chocolate, which contains up to 5% vegetable fat, was entitled to be sold across the EU. The verdict marks the end of a 30-year battle between UK firms and Europe's so-called chocolate purists. Spain and Italy had argued for decades that the British version could only be sold if labelled as a "chocolate substitute". A compromise deal was reached in 2000, when the EU decided to allow small amounts of vegetable fat, provided the ingredients were clearly labelled. But Spain and Italy had continued to discriminate against British chocolate, forcing the European Commission to take them to court. The judges rejected Spanish and Italian claims that chocolate restrictions had been "based on the need for consumer protection". Both countries, said the court, were in breach of EU rules on the free movement of goods. Labour leader in the European Parliament, Gary Titley, welcomed the outcome. "For the Cadbury's factory making Dairy Milk in Birmingham, and people in York putting Terry's Chocolate Oranges together, a positive ruling will be a sweet victory indeed," he said. Labour's European Parliament spokesman on European affairs, Phillip Whitehead, said the verdict was good news for British jobs and chocolate lovers. "This is what Europe should be doing - breaking down barriers to give British companies unfettered access to the biggest consumer market in the world. "This positive ruling brings the long-running saga of British chocolate to an end." During the lengthy dispute some of the best brains in Brussels and EU member states have grappled with questions such as whether chocolate containing vegetable fat is worthy of the name chocolate. And successive British governments have had to fend off attempts to label the British product as "vegelate" - and even attempts to ban it altogether. "The ruling ends 30 years of EU wrangling"